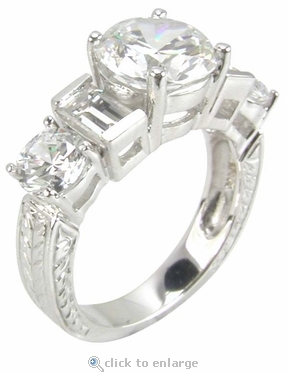 The Geo Round Cubic Zirconia Emerald Cut Engraved Antique Estate Style Ring features a 2 carat 8mm round diamond quality cubic zirconia set between a .25 carat each emerald step cut cubic zirconia then followed by a single .50 carat round. The beauty of this vintage estate style ring is not only the amazing combination of the shapes of diamond look stones but also the detailed elegant engraved details on the shank of the ring. 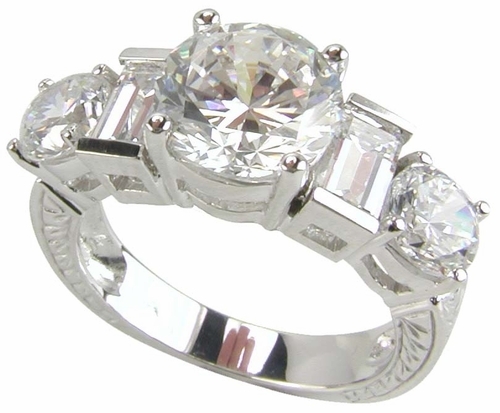 If you love the look of up to date and modern jewelry but you also love antique vintage estate style jewelry, then this ring may be perfect for you. It can be worn as an engagement ring that you can couple with a band for a wedding set or you can wear it on its own for a stylish diamond look ring. The original Russian formula lab created man made cubic zirconia stones that are set in this ring are all hand cut and hand polished to exact diamond specifications. The shank of the ring has estate style hand engraved details that line 3/4 of the way down the shank. The total carat weight is 3.5 carats of the finest diamond simulants available. This ring can also be ordered in 14k yellow gold, 18k gold or luxurious Platinum via special order. 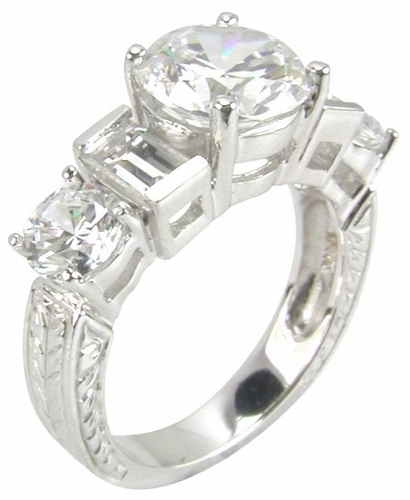 Call us for a quote at 1-866-ZIAMOND or live chat with a Ziamond cubic zirconia jewelry expert.